A North Forest Beach Sandcastle, suitable for an island king and queen and the rest of their family. The ocean is only a two-minute stroll away from this beach retreat with its very private *heated pool that’s fenced in for secluded relaxation. Decorated with coastal comfortable furnishings and state-of-the-art appliances. When not spending time at the beach and poolside the whole family will enjoy having fun in the recreation room with ping-pong and hot tub or just lounging on the sea-breeze-swept screened in porch overlooking the pool deck. 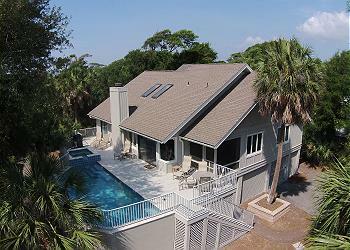 •	*Private Heated Pool ( 12 x 22) (*Pool can be heated at an additional charge. This pool has a gas pool heater. The cost per week is $575.00 to $875.00 depending on the season.l.